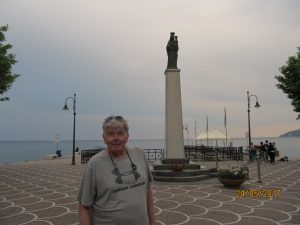 It seemed like we had just arrived but this was our last full day on The Almalfi Coast. With no alarm clock we slept in past 11:00 AM. 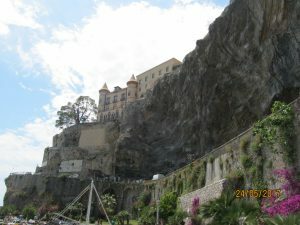 The activities earlier this week from Lisbon to Rome, on to Naples and The Almalfi Coast had really caught up with us! Not to worry, after we got up and looked out at another beautiful day from the patio, we strolled again down to Tony’s and had another amazing lunch!I had the chicken panini again and Hubby had a burger. It was again great food and for 22 Euros including wine and beer, it was a deal! 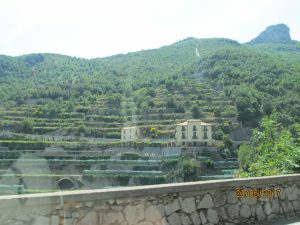 The Lemon Groves Growing on the Sides of the Mountain Cliffs in Maiori! After lunch we walked up several of the lovely streets which lead to the hillsides above. There were lots of expensive hotels up there at 500 Euros per night. 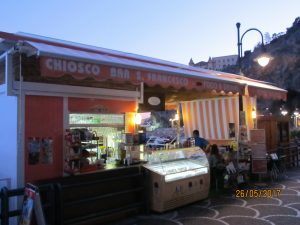 We walked up Piazza Raffaele D’Amato and we again checked out some more of the little shops that dotted the streetscape and mountainside. We picked some gin for the weekend coming up in Venice and a few goodies to take with us as well. We decided to do this because we were travelling by train up to Venice and because we had no idea how difficult it might be to find shops in the area where we were staying. We also decided to get a few huge lemons because they were so plentiful in Maiori. There was a lemon tree right outside of our hotel room and you could pick the lemons off the tree but up close they were starting to decay. 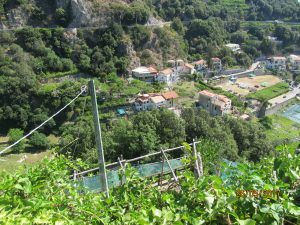 The Streets of Maiori and the Lemon Groves on the Mountainside! 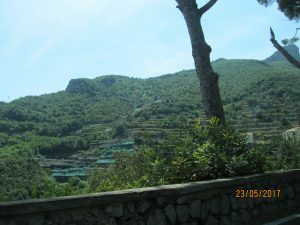 We were amazed by the lemon groves that were growing into hillsides and you could certainly smell the fragrance of lemons in the air. 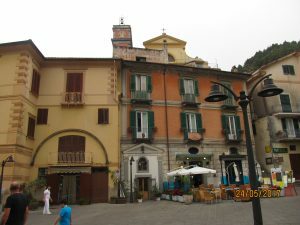 We sat on the the benches near the base of the mountain on Piazza Raffaele and watched the people go and come about their daily business. 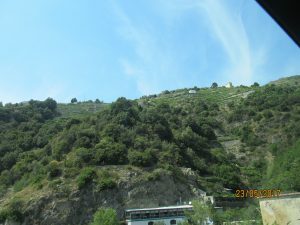 We had debated if we would go further up into the mountainside area which was quite steep but it seemed like we would be invading the space of the leviers who were descending from the mountainside to get on with their daily lives. I turned to Hubby and mentioned that it was almost like looking into a book that had opened up and that we were bystanders as the people mulled around us, just nodding as they passed by! It certainly was a privilege to see just how happy the people were as they descended from their mountain homes, all on foot! 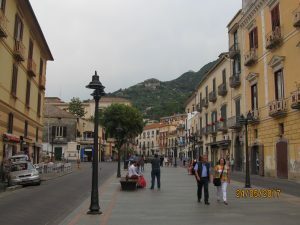 Piazza Raffaele & the Views of the Streets of Maiori on the Almalfi Coast! 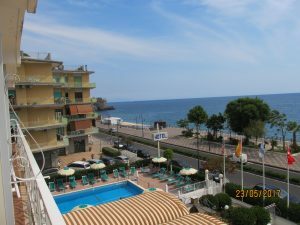 We then returned to the Hotel Pietre and spent the afternoon soaking up the sun next to the nice sized pool. There were lots of nice chairs and tables complete with umbrellas to protect us from the south Italian sun. Hubby and I jumped in the pool after a bit of sitting around. It was a shock to the system as the pool was unheated and just slightly warmer than Holyrood Park in high summer in Newfoundland. A couple of Americans approached Hubby while he was in the pool. They pulled up the pool thermometer and it read 72F or 22 C and commented that it was too cold by their standards! Hubby couldn’t resist and told them that this was warm by our standards. 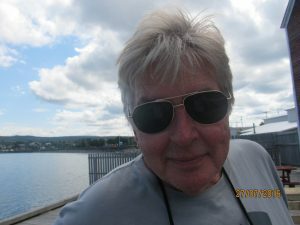 He bragged that back in Newfoundland we were in the ponds as soon as the ice melted. I’m not sure if they believed him though! Cold Day For a Swim By American Standards! After an afternoon at the pool, time to hang out on the patio. Relaxation was the theme for today. Tomorrow would be a travel day and a busy day! 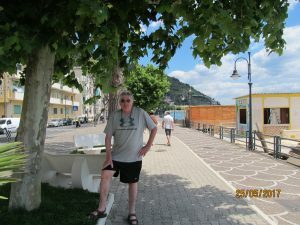 For dinner we walked the lovely seafront promenade to Chiosco Bar Francesco which was a small place right on the water. A friendly couple operate the place and there is no formal menu. Franco, the owner makes a few suggestions and you go from there! His past creations seemed delicious and are homemade from scratch by the missus in the kitchen! Hubby had Lasagna which he enjoyed very much. I had the Manicotti with cheese which was also pretty good. With a couple of glasses of wine each, dinner cost us 22 Euros including tip. The owner came out with a glass of cimoncello each as we were leaving. We would recommend this place, as the food and service was very good! Again the locals seemed to eat here too and that is always a great sign when you visit unknown places! Chiosco Bar Francesco & Our Day Out! It was a lovely evening for a stroll back on the oceanfront promenade to the hotel. It was in fact gorgeous with a warm light breeze and the moon was shining gloriously to guide us back. What a perfect last night on The Almalfi Coast. We sat out on the balcony of the Hotel Pietre Di Luna for a nightcap! Hubby raised his glass and noted that it didn’t get much better than this anywhere! 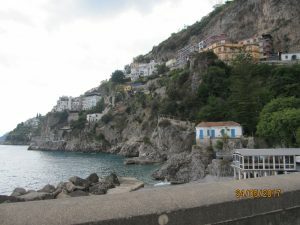 We thoroughly enjoyed our brief stay on The Almalfi Coast! Venice it would be tomorrow!